There are plane people. And there are train people. Some people want to get there yesterday. Others, like me, enjoy the journey. For train people, the trip begins when you step onboard. Settle into your seat. Wait for that forward lurch when the wheels engage, signaling the journey has begun. It’s slow travel; scenic, relaxing and sometimes adventurous. But never ever boring, no matter what itinerary you choose. One of my favorite things to do either Silver Star or Silver Meteor is to try to spot the Jefferson Memorial as the train crosses the 14th Street Bridge. You have to be quick. I’ve been riding Amtrak overnight trains since before there was an Amtrak. My first overnight train ride was a solo trip at age 12 aboard the Santa Fe Super Chief. My dad tipped the room attendant to “keep an eye on me.” I waved good-bye to my parents through the thick glass window as the train left the platform in Chicago. I was on my first train adventure, to visit family in Arizona. Then, in 1970, Congress created Amtrak in an attempt to revitalize train travel. The following year, Amtrak officially took over the management of a nation-wide rail system. While trains’ names may have changed, or worse, disappeared, some linger like the last flicker of sun setting behind the burnt-red colored rocks, ironically seen from aboard the long-running California Zephyr. It’s quite a picture. I used to take The City of Miami train which ran from Chicago to, you guessed it, Miami. But now it’s gone, Instead, you now have to take a train from Chicago to New York. Next, from New York City’s Penn Station, it’s all aboard one of two Amtrak Silver Service trains that runs between the Big Apple and Miami. Their names are Silver Star and Silver Meteor, operating about four hours apart from each other. While I’ve been a frequent passenger on both, recently I took the Silver Star from Winter Park, near Orlando, to New York City. A mere 21 1/2 hours overnight train ride. 6:30 pm – I arrived at the small but busy Amtrak station in the heart of downtown Winter Park. I’ve tried the Orlando and Kissimmee train stations and prefer the one in Winter Park. My train was scheduled to arrive on time at 7:41pm. And the new Winter Park Amtrak train station. 7:20 pm-ish – A five minute walk from the coffee shop on Park Avenue and I was back at the station. I could have relinquished my larger suitcase to the baggage car, but I’ve done this run before and know how to safely secure my suitcase in my tiny roomette so it doesn’t take up too much space. 7:30 pm– The station agent announces the arrival of our train and all the passengers in the building scatter to their designated waiting points along the platform, carefully observing not to get to close to the yellow line. Coach passengers going to various destinations had different places to stand for their train car. Sleeping car passengers, like me, had our own area to congregate, although there were only four of us compared to at least twenty-five coach passengers. With twenty-four station stops along the way to New York City, it was anyone’s guess who was going where. 7:45 pm – My train car attendant checked my ticket, hoisted my luggage onto the train and carried them into my roomette. I neatly put my bags where they always go; on a ledge, under the seat, next to the door and on a hook. Tucked away into my little compartment, I said a quiet goodbye to Winter Park and watched out the window as we traveled from urban to rural in a matter of minutes. Another Amtrak adventure was under way. Dining Car at lunch time. For dinner, there are tablecloths. Ed. Note: The dining car has been removed from the Silver Star. However, the Silver Meteor still has a full-service dining car, exactly as shown or upgraded. Read what it’s like aboard the Silver Star without the dining car. 8:00 pm– At the request of the dining room attendant who walked through to welcome the newly-boarded, I left my roomette and walked through two sleeper cars to the dining car for an eight o’clock seating. The drill was familiar. Wait in the doorway until the Dining Chief beckons and tells you where to sit. You’ll be seated at a table for four and if you are lucky, the three others at your table will be friendly, conversant and all-around pleasant table-mates. China plates are now disposable plastic, the cutlery is either real metal or silver-colored plastic. Wine glasses are also plastic. Except for the cooked to order steak (and eggs in the morning), much of the food is microwaved. There is a vegetarian option as well as fish. Salad is served (packets of Paul Newman dressing are on each table) with your beverage while your entree is prepared. I chose the “grilled” salmon and rice which was amazingly excellent. Dessert was pretty good, too. All meals (and bottled water) are included if you have a a sleeping compartment. As for table-mates, I lucked out. I was seated with three other solo women travelers. One woman in her mid-sixties, was headed to New York to rendezvous with her new boyfriend that she reconnected with at their 40th high school reunion. Of the other two across from us, one was rather quiet and left for her sleeper right after coffee. So the three of us closed the diner! 9:30 pm – Upon returning to my compartment, my bed had been turned down, an extra pillow added (at my request), shades closed and the tiny reading light above my bed lent a welcoming glow to the room. Trusty Kindle in hand, I read for a while, peeked out from the shades to see where we had stopped (Florence, SC). As the passengers stepped off the train, hugs were the norm as families and friends were reunited. Shades closed again, I went to sleep. 7:00 am – We were somewhere in North Carolina and the scenery was beautiful. Of course I couldn’t help but “play” the music and lyrics to that old song over and over in my head. Oh well, it goes with the territory. 8:00 am – Time to eat again. Unlike dinner where you have a reserved seating time, breakfast (and lunch) are open seating. For coach passengers, it’s pay-as-you-go, so many will choose to either brown bag it or get snacks from the Club Car. Eggs, whether omelet, over-easy or scrambled, are prepared to order. No frozen eggs. Real eggs, real toast and even grits. Not to mention piping hot “train” coffee. Years ago, the coffee was so strong it didn’t even need a cup. Now it’s mellowed a bit and your cup doesn’t stay empty for too long. 9:30 am – By the time I returned to my room, we were almost out of North Carolina, edging into southern Virginia and only ten hours to New York. My room was already made up; the bed stowed into the wall and chairs popped back up. A current USA Today was neatly folded on my chair and a fresh hand towel was placed above the sink. In case someone feels the need to shower, there is a public shower room in each sleeper car. No one ever seems to use it. On really long-haul trips, I’ll grab my shampoo and conditioner and head over to the shower room. It’s challenging to take a shower on a train going 80 mph, but fun to try. Each roomette has two electric outlets, so after your shower, you can use your hair dryer and charge your phone at the same time. Ooh. The simple things in life. Before I knew it, the Dining Chief announced yet another meal; it was time for lunch. I closed up my laptop, put it away, slipped my shoes back on and made the “long” walk back to the dining car. Didn’t I just do this a few minutes ago? 1:00pm – Rather than repeat what I wrote about the last two meals, I’ll quickly note that lunch was quite good. There’s a selection of hot and cold sandwiches, a chef’s salad, soup and of course, dessert. There are always a few non-meat meals on an Amtrak menu. The day seemed to quickly pass and soon we were in Washington, D.C. En route, the train raced through Richmond,VA as well as a couple of university towns. It’s interesting scenery, so I probably spent as much time looking out of my window as I did trying to write a couple of articles. This route is especially picturesque in winter, even better further north if there’s a dusting of snow. The train rolls past what looks like a scene from a Thomas Kincaid painting; singularly lit little houses and storefronts, no more than maybe two dozen yards away from the tracks. It’s almost like you were suddenly transported to the middle of a toy train set, one that was carefully assembled in a cozy living room over the winter holidays. It’s all too quaint. Since we were scheduled to arrive into New York City just a little before eight o’clock, there wasn’t dinner service, though the Club Car would serve lighter fare. The crew had to break everything down, tally up and clean up before reaching New York’s historic Pennsylvania Station. The past eighteen hours seemed like an eat-a-thon anyway, so I wasn’t hungry. And it would give me something to do in NYC; find a restaurant with take-out, close to the hotel. Note again that the Silver Star doesn’t have a dining car anymore. But you will have the above-described food fest on the Silver Meteor. Taking photos from the train. 7:00 pm – Time to start organizing and putting away. Over the years, I’ve learned to pack for the train so repacking isn’t too difficult. It’s all the electronic miscellany that slows me down. Cords, charges, phone, camera, batteries…all have to be put away. If you’re wondering why I have my camera out, it’s because I keep it at the ready to take photos from the train. If you are remotely interested, it is very important to be ready because, going 70 mph, you have to frame and shoot pretty fast. Lighting is also an issue as is the reflection in the window. I find it helps to sit in the chair that faces forward, (there are two chairs in a roomette) then when you spot something coming up, you quickly jump to the other chair that makes you sit backwards. The angle of looking back at the glass window diminishes the glare or reflection so you can get a pretty good shot. That’s how I was able to get the shot of the Jefferson Memorial. 7:30 pm – Our train began its descent under the Hudson River which takes about 3-4 minutes in the one-way tunnel (built in 1910.) The ascent begins, your ears pop and you emerge under the bright lights of bustling Penn Station. Time to assemble my luggage. A train person had walked past my room just before arriving in New York asking if anyone would need luggage assistance. Unfortunately, I didn’t hear her. As the train slowly came to a halt, the transom opened, the stairs unfolded and an extended arm from the attendant helped all of us alight from the train. I was the last to leave and to my dismay, the Red Cap had already left with his luggage cart filled to the max. I was alone on the platform, hoping for another Red Cap to come by. Not one in sight. Just as I was about to haul my gear myself, the conductor steps off the train and asks why I didn’t already have the Red Cap to assist me. I said I didn’t hear the announcement and I was waiting to see if anyone would return with a luggage cart. He said no, they had left, but he would help me. I tried to convince him otherwise…it wasn’t in his job description for sure. But he wouldn’t take no for an answer. He wheeled my two heaviest bags across the platform, up the escalator, and across the expansive station. Not only did he take my bags to the curb, he also flagged down a taxi! When was the last time a co-pilot or flight navigator helped with YOUR luggage! Even though he refused, I insisted on giving him the tip that would have gone to the Red Cap. “Take you wife out for a drink or a movie,” I suggested, as she was patiently waiting for him on the platform when he sped past with my luggage. How much did this trip cost? N.B. There’s something magic about train travel. Maybe it’s the throwback to a simpler time or a childhood memory. Whatever it is; the sound of a distant train whistle, the rumble of the wheels as the train passes by or a wave from the engineer to a small, wide-eyed child, there’s something uniquely special about trains. Sherry, in answer to your recent response to me: No, we are taking the “always late” Cresent from Phila to New Orleans. Thanks so much for your comment. And good for you and your wife to each have a roomette. So much more comfortable. It’s interesting how the train can make up for lost time but I’ve seen it happen quite a bit. I’ll guess that you are flying to New Orleans to pick up the Sunset Limited? Have a wonderful train ride out west! Thank you again for writing. Hi Sherry, My wife and I just completed our second Philadelphia to Ft. Lauderdale trip. Like last year, we “old folks” each had our own roomette. We were on-time all the way down, but near Sebring, FL, a passenger had a medical emergency. A ambulance was called, and the person was taken to the hospital. Somehow the train was able to make up the lost time, and we arrived 4 minutes early. I need to point out to those reading this that trains are often NOT “on time” . This is usually due to freight train traffic (Amtrak does not own most of the rails). We will be flying home. A rail trip to Arizona, via New Orleans, is booked for May. 1. I have priced out every possible angle for Amtrak and if only for peace of mind to be sure to get a sleeper, I think I would buy individual segments and the sleeper ahead of time. I think the rail passes are great especially for coach travel but I don’t know how far in advance you can upgrade to a sleeper and they are usually sold out in advance. 2. As a travel agent for 25 years, I can honestly say that using a travel agent to book a cruise is by far the way to go. However, not all travel agents know how to book Amtrak nor are they familiar with the routes or all the complexities, as you discovered. I’ve been using Amtrak since day one of its existence but I don’t book travel anymore. Travel agents that book Amtrak don’t get any particular perks or amenities to pass along to their clients, unlike the cruise lines. If you have time, please drop me a note and let me know if you have found someone. Fingers crossed! Thanks again and have a fantastic cross-country trip. (I also have how to pack for an overnight Amtrak article, too). Thank you so much for your article. I am planning a cross country train trip for the fall of 2020 and have been reading all I can to be sure I as prepared as possible. I will be taking the Empire Builder West from Chicago then the Coastal Starlight south to San Francisco and finally the California Zephyr back East. The trip will be a total of 19 days getting on and off the train at various stops. I have put a lot of work into the planning the itinerary and plan to buy the tickets as soon as possible roughly a year in advance in hopes of getting the best deals. I have two questions for you. 1) Any recommendations or experience purchasing an Amtrak Rail Pass and paying the upgrade cost for a roomette or is it recommended to just buy each leg individually since you have to pay for the the roomette upgrade anyway? 2) Given the complexities of the trip, I have heard people mention the benefits of using a travel agent to book. Apparently they possess some insider benefits/recommendations. Do you have any thoughts/recommendations on using a travel agent? I have been challenged with locating a travel agent in the Chicago area that has an expertise in rail travel. Are you familiar with any? Thank you so much and really enjoyed reading your post! Good question. Most Amtrak stations have free, overnight parking for their passengers. You would need to tell the Amtrak station attendant that you’re leaving your car overnight and the dates. You could also call the station and ask for information. It’s always tricky to park at an Amtrak station because the long-term parking places are not reserved and sometimes locals use Amtrak’s lot, even though they can be towed. If possible, could you Uber or Lyft to a nearby station? I’ve also done one-way car rentals from my hometown to the departure station and the car rental place drives me to the station. I’ve done this in several cities. Best bet…call the station first and see what you find. Good luck. After 1M Flying Miles, in retirement I only travel by train! I’d love to depart to DC from either Winter Haven (preferred) or Kissimmee station, but I require a park-and-ride for 5, 7 up to 9 days. I’m not worried about fees, I just don’t want to come home to find my car was towed & impounded (for those that suggest I leave it at the Winter Haven Wal-Mart and cross my fingers!). There are a couple parking spots at the Winter Haven Amtrak, and a huge new garage at the Kissimmee SunRail upgrade; but do they allow overnight long-term parking? If not, do you know any legal parking within a few miles (I can walk or Uber over to the station). I want to rest assured my car wont be stolen or towed. Thanks for the help. This is just crazy, I can’t be the only one needing 7-day park-and-ride. Your best bet would be to contact AMTRAK (1-800-USA-RAIL) and discuss your preferred travel plans. There is only one set of tracks on the route from NY to Florida. You could take either the Silver Meteor (with a dining car) or the Silver Star (no dining car) and make overnight stops along the way. Some points worth stopping at would be Washington DC, Charleston, SC., and Savannah, GA. Tell the Amtrak reservation person what you are trying to put together and see what he or she might suggest. Whatever you choose, have a fabulous trip. I am looking to make a Multi-City ride from NY to FL, does anyone know what would be the best route for it? Your comment is perhaps the most poetic account of past and soon-to-be train trips that I’ve ever read. Free-flowing thoughts and feelings. Thank you so much for sharing this with my readers and me. Happy Birthday to you and many more happy train rides. I’d be thrilled if you’d send a follow-up upon your return. Have a wonderful birthday train ride. I am about to embark on my own Birthday Celebration from MIA to NY Penn. Traveling is not for everyone, I seem to be the one that enjoys it the most in my family, therefore even if alone… All Aboard, I am ready. Having cut the cake with family, neighbors and friends, another cake with co-workers. Dined with hubby and immediate family. Gotten all pretty up and everyone back to their weekly routine. Riding Amtrak on Halloween Day and to close my October Birthday Celebrations for this fall baby is where I’d be. I am hoping for lots color, changing leaves, or just relaxing is more than enough. My first USA train ride was in May 2018, and this will mark 6th in a few short months. The train, the whistle, meals, laid back atmosphere, the personnel all helped make me a train lover from the very first trip. My husband and I commute to see each other and have been doing so for the most part of 2018. He prefers coach; I am more mellow, selfish of my time, surroundings and submit to the bedroom accommodations. This will be my first overnight on the train and attempting to shower in cabin before train arrives to NY. I would had rather given full accounts after return train, but too excited to postpone the response opportunity. Another night at home, carefully packing for a longer train trip, foreseeing various temperature changes all in a small carry-on. Hoping to recount upon my return celebratory train trip on Amtrak. Hi Shela, you will likely have to present ID when you purchase your ticket. Contact your transportation office for complete details. If I travel Miami to New York by trail or bus , it is need ID or passport? What a wonderful comment! I’m so glad you are enjoying the train. Everything you mentioned is so true. Sadly, and this is my opinion, our nation is based on cars, highways, airplanes and oil. Trains take a back seat, unlike in every other developed nation. The new President of Amtrak came right from the airlines (Delta I think) and is already slashing two dining cars; from the Capital Limited and Lake Shore Limited, both absolutely fabulous routes with amazing scenery. The Silver Star has also lost its diner. Many smaller stations are being changed to unstaffed, too. If I had any answer to a solution…even a partial remedy…I’d be on the next train to Washington! Til then, we just have to keep supporting our trains. At least several states are kicking in money so their residents aren’t left without a means of transportation. Not everyone can afford to fly, for financial and even medical reasons. OKAY! I’m off my soapbox! Thank you so much for your thoughtful note. Hi, Sherry. Thank you so much for your train blog. My sister and I traveled on the Silver Meteor last year from Orlando, FL to Savannah, GA and got totally hooked on train travel. This year we traveled again via Silver Meteor from Orlando to Charleston over the Christmas holidays, and just recently last week to Savannah again. The dining car is such a neat experience and the food is surprisingly good. Also, she is 6 feet tall and I am 5’9″, so the VERY generous leg room on a train is so much more comfortable than being crammed like a sardine into an airplane seat. Also, there is a lot more room for carry on bags in the overhead area of a train than there is on a plane. Airplane travel is getting worse and worse as far as leg room goes, i.e. they are cramming more seats into the existing space on the planes. My sister now lives in Atlanta, GA and I live in Clearwater, FL. How I wish that Amtrak had tracks and trains that went up the WEST coast of Florida from Tampa to connect to Atlanta. And yes, there are sometimes delays with train travel, but it’s still not a deal breaker when you consider all the other positives about it. How can we convince the Federal Government to beef up Amtrak, build more tracks, and give us more trains! Thank you for your email question. I would suggest that you phone Amtrak (1-800-USA-RAIL) and let one of their agents advise you about the Auto Train. It only runs between Herndon, VA (just outside of Washington, DC) and Sanford, FL. Once in Sanford, you’d have a couple of hours drive to Brooksville, plus the long drive from NH to Washington. After a Horus trip by car in January, from NH to FL. I am interested in the AutoTrain , for next winter. Would be going from NH to Tampa, then north to Brooksville. Will be by myself and am elderly, any advice? Suggestions. No, the maximum amount of time that you can have your dog aboard with you is seven hours and only in coach. There are also very strict carrier sizes. You can find more information at Amtrak.com. Can pets travel with you from NY to Florida? Thanks for your comment. I am happy to hear that each of you had your own roomette. Two in one roomette can get a bit tight, and maneuverability isn’t easy! I’ve taken the Silver Star sans dining car twice. Whenever possible, I opt for the Silver Meteor. Even if I don’t go to the dining car and get room service instead, I enjoy it more than the microwaved food in the Amcafé. I’m so glad your trip was enjoyable. Have a wonderful train ride next year, too! We took the Silver Meteor from Philadelphia to Ft. Lauderdale last week. My wife and I are in our 70s, and we each had our own roomette. We are glad we did. Also, the Silver Meteor has a dining car, and the earlier Silver Star does not. The Silver Star trip is 4 hours longer (which is not a big deal since they both arrive around the same time). The trip was great, as were the station red caps, and our sleeping car porter named Sonny. Meals were included, and they were very good. We are going to fly home, but will most likely take the train down again next year. Thank you for your comment. The only overnight train without the dining car is the Silver Star. I’ve added a notation in the article. The Silver Meteor still has a full-service dining car. Thanks again for pointing out about the update about dining. Amtrak no longer has a dining car. The have discontinued that on the N.Y. to Florida trip. Very disappointed, I taken this trip before and the dining car was one of the best things. Your best bet would be to contact Amtrak directly at 1-800-USA-RAIL. There is a train that can get you as far as Tampa, but Amtrak might offer dedicated bus service to points south. Have a great train trip! i WANT TO TRAVEL FROM NYC, NY TO MARCO ISLAND FLORIDA. COULD YOU TELL ME WHAT TRAIN AND WHAT TRAIN STOP I WOULD GET OFF IN FLORIDA THAT IS CLOSEST TO MARCO ISLAND, FL. Hi Dinorah, I hope your relatives are safe and sound and out of Florida. About your question…yes. Amtrak has a lift to help someone in either a wheelchair or who might have difficulty climbing up the steep train steps. There is also a sleeping compartment designed for someone with a physical disability and/or a wheelchair. The bedrooms are very comfortable, although compact. The compartment that I mentioned above is very spacious for a train compartment. They are fine for any age. If you have any more questions, please ask. I just found your blog while trying to find information regarding service from Miami to NYC for relatives as they are attempting to leave Florida before Hurricane Irma hits. Aside from this, my question is: Have you seen any passengers with physical disability and/or wheelchair on train? Would you consider it would be comfortable in bedroom for 13 year old? Thank you!! You’re welcome! I hope you both have a wonderful train ride and a happy birthday celebration! You’re welcome! I hope you have a wonderful train ride and a very happy birthday! Thank you for your insights. My wife and I are taking the train from Boston to Flordia for my 65th birthday this fall. I just wanted to do something different. We will be taking the Silver Meteor for what we hope will be an enjoyable experience. Thanks very much, David. I agree with you about the Star…such a shame…but on a positive note, it does make it possible for some people to experience an overnight train ride at a reduced rate. Thank you also for subscribing to my newsletter. Thanks for the blog, I should have thought to do this since I have not done planes since 2002. I have enjoyed taking the Silver Meteor and Star over the past 13 years, my parents would sometime take the train intead of flying when I was under five so it brings back lots of memories. I now avoid the Star since it does not have a dining car anymore, my last trip wa on the Meteor in October of 2016. I will definitely subscribe to your newsletter. Congrats! Have a wonderful train ride and vacation. Car should be fine. Thanks for the update. Booked for May and will be arriving in Winter Haven…….Looks like we will rent from Avis, which is just about a mile away. Praying this car rental works out. Will be spending a week in Clearwater Beach and then a week with friends in Naples. You’re welcome! Winter Haven is nice, too. I’d leave from where it’s most convenient for you. Thank you so much for your reply. This is great news! Is Winter Haven a better train station to return home? thank you so much!!! Thank you for your nice comment! About your question, yes, you should feel safe to travel aboard Amtrak. Your roomette locks from the inside. The sleeping car attendant is pretty vigilant and the arrangement of the sleeping cars makes walking through them a one-way trip, so only those in the sleepers need enter. When you leave your roomette, the door does not lock (as they do in Europe) so take your purse with you. About arriving into Penn, I’m guessing you will be aboard the Silver Star (note: it does not have a dining car) you should get there about 6:50pm. I don’t know your departure time for the train up to Hudson, but I’ll assume you are in coach. Again, I can’t see any reason why you should not feel safe aboard the train. Both Lakeland and Kissimmee are popular train stations and well lit and staffed. I’m assuming that the Hudson station is staffed at night and that you either have a ride, or your car is there. You can always call an Uber or taxi to meet the train…just call before your train arrives so it’ll be there waiting for you upon arrival. Have a wonderful train adventure! Enjoy the view and solo experience and thank you for reading my blog. Sorry Sherry! I mean to say, Are you safe traveling alone on the train? Thank you. Hi Sherry, Thank you so much for this blog. I am going to be traveling from Hudson Ny to Penn Station then on to Lake Land Florida. I was hoping you could give me some help. Are you safe traveling on the train, I do have the roomette? Also do you know if Lakeland is a good station to go into? I will be coming back from Kissamee, Florida. Any thoughts on that train station? And sorry, one final questions? Do you know, or do you know how to find out, I will be coming in to Penn Station from Florida late at night, is the train safe from Penn Station to Hudson, NY traveling along late? Thank you, I am so hoping you will put my mind at ease. Small dogs and cats, under 20 pounds including carrier, are allowed to travel with their human in coach class for up to 7 hours. You can read more about traveling on Amtrak with pets here. Thanks for your comment. Are small dogs allowed ? Hi Al, Thanks for reading my blog. I’ve used Avis at Winter Park for years. They will pick you up at the Amtrak station, which is about 1 mile away (they recently moved.) Same with returning the car. You can call them directly and they’ll tell you to call when you pull into the station. I used Enterprise once just to try it. I might try the Deland station sometime…but Winter Park is really convenient and easy and parking is free if you can find a spot! Have a wonderful trip. I see you traveled from Winter Park. We are trying to figure out which train station in Florida has a car rental agency within walking distance? Looks like Winter Park has an Enterprise Rental just a couple of blocks away……..any suggestions?? Our plan is to take the train down to Fla, rent a car and then drive down to the keys. Thank you for the glowing review. Much appreciated. I too have taken the train between London and Glasgow (and then onto Gourock and ferry to Dunoon!) and it is a great train ride. The location of your hotel in NYC put you right in the midst of the action – so much fun. When you plan your Amtrak trip from Miami to NYC, if you can budget for a bedroom (not a roomette) and also to go on the Silver Meteor (with the dining car) vs. the Silver Star without a dining can, you will enjoy your trip even more. Thank you again for reading my Amtrak articles and taking the time for such a nice email. Feel free to email me if you have any questions. I really enjoyed reading your fascinating story of your journey on AMTRAC. We are from Scotland and regularly travel from Glasgow to London first class, If we book well in advance we pay only a few pounds more, and sometimes the same cost as a second class ticket. We both love train journeys and travel this way as often as possible. The Journey time is between Glasgow and London is only approx 6 hrs and sounds like a breeze compared to the journey which you undertook. We have just retuned from a cruise from New York to the Caribbean and stayed 3 nights in NY at the Wyndham New Yorker Hotel on 48th Ave and 34th Street diagonally across from Penn Station and Madison Square Gardens. We had a the wonderful opportunity to meet up with relatives in NY. Next year we hope to take a cruise from Miami to different Islands, and then travel to NY to meet up with family again. The information that you have given will be very useful in helping us plan our trip. Your story has been invaluable and will certainly help us to plan and make the most of our journey. Once again, thank you for such a wonderful travelogue. My mother and I plan on taking Amtrak this December from Palm Beach to New York. We are in VIEWLINER ROOMETTE, room 001. I am worried that this is right by the doors and coffee station and may be noisy. By chance would you know the best areas to stay in or the areas to definitely avoid? I loved reading your story and look forward to our trip. Hi Asaf, thank you for reading my Amtrak article. Keep in mind that the Silver Star no longer offers a dining car. There is a snack bar of sorts with microwave pizza, cold sandwiches, and a big selection of chips, nuts, beverages etc. Since you are traveling with your children, I’d suggest packing a cooler with foods and drinks for your kids, if possible. While you can get by with the selection Amcafé menu, it may not be the best for kids as sometimes the wait for service can be a while. However, because you are in a bedroom sleeper (with lots of room for a cooler!) your car attendant can and will head to the snack car for you and bring back whatever you’d like. It’s a good idea to bring cash in small bills to give to your car attendant because he or she will pay the snack bar server for your room service order. If it gets chilly, you can always ask for an extra blanket (they’re pretty thin) but you might consider bringing a small throw blanket from home. Chances are your room will be warmer than colder! Have a terrific train trip! Sherry — thanks for the wonderful article. I plan to take my wife and our kids (9 and 5) from New York to Orlando on the Silver Star bedroom cars on DEc 31st. Any tips for traveling with children, we always fly to Orlando and this will be the first Amtrak trip. I hear the temperature in the rooms can vary (cold to very hot). Thank you! Thank you for your email and your nice compliment about my photo. I must congratulate you for knowing (and taking!) the Winter Park boat tour. I’ve taken that boat ride many times over the years and it’s so much fun. Okay, about the train ride. You said you planned to take the Silver Star from NYC to Miami. Be aware that the Silver Star does not have a dining car. The only food option is from the Amcafé car, cold or microwaved food. Now because you’d be in an accommodation, your car attendant can take your food order and go to the café car for you and bring it back to your room. However, if you want the dining car experience, then your other option is to be aboard the Silver Meteor (NYC-MIA) which has the iconic Amtrak dining car for three complimentary meals a day. About what to reserve for compartment(s). You have two options: 1. Reserve two Roomettes right across from each other or 2. Book a bedroom suite, which is two adjoining bedrooms, each having it’s own en suite bathroom. The roomette has a sink and toilet (it’s in your room but not in an enclosed space) and the shower facility is down the hall. About what side of the train is best. If you get two roomettes (definitely the lesser expensive option) then no matter where the scenery is, you can hop back and forth between compartments! If you opt for the two attached bedrooms then it’s not easy to predict which side of the train you’ll be because the car can be coupled from either end. I don’t know what season you will travel but in order to get a really clear view of the Memorial, it can’t be during the summer as trees and leaves obscure the view. However, there’s my trick. Looking out the window while sitting on the right-hand side of the train as you head southbound…you’ll pass a lot of official Washington DC buildings and go over a couple of highways. If you are looking forward and see where the river and bridge begin, (it’s tricky) the Jefferson Memorial will be on your right side IMMEDIATELY before your train starts to cross the 14th street bridge. So you need to be ready with your camera BEFORE you reach the bridge or it’s almost too late. Here’s your clue: When you see a marina with small boats on your left, you’ll cross a very tiny bridge. Then there’s a small stretch before the 14th street bridge and that’s where the Memorial is located. I hope this info is helpful! Thank you again for your email and have a wonderful time! P.S. Feel free to send me YOUR Jefferson Memorial photo! We are from England, UK and have pondered on doing this journey a few years now but the other way from New York to Miami. We plan on getting a plane from UK to Manhatten and staying at the New Yorker which is just opposite Penn station for 3/4 nights before taking the Amtrak silver star to Winter Park. We’ve been to Winter park, Park ave many times whilst staying in Orlando and just love the shops on Park Ave with its squirrels and its scenic boat tour. We were planning on hiring a car from Winter Park for the remain of our two week vacation in Florida!!! Do they do cabins for 2 adults and a child(13 yrs)? Also, what side of the train is best for views? Is it best to sit on the left or on the right or does it not really matter? Just wondered so I could get a shot of the Jefferson Memorial like you did and any other good shots. Obviously, we will be travelling the opposite direction to yours so will need to take that into account!!! Welcome to the non-flyers club! Amazing that you are able to get a running start for your trip to Miami. Have a wonderful trip. I don’t know which side of the train you will be, but if you’re on the right side going south, be sure to spot the Jefferson Memorial just before the bridge from DC and keep an eye out (either side) when you cross the Chesapeake…it’s beautiful. Have a wonderful train ride and thank you for taking the time for your comment. Great domain name! Happy travels! Loved your account of the trip and all of the positive information and posts listed here. Traveling this weekend from BOS>MIA for work and now I know I made the right decision. I am just not a “flyer” anymore, but really do want to travel more, and thought this was a great way to get to and from. Look forward to reading more about your trips – and will be posting about my own trip this upcoming week. I also appreciate you saying that you are a “travel writer who does not fly…. I hope to inspire you to travel without flying.” I think those of us who do not fly should also be seen as confident for the modes of transportation we do choose to use and that’s what I felt when I read your description. Sometimes its more about the journey than the destination (and yes, you may quote me on that 😉 Safe travels to all! My son and I will be traveling from Trenton NJ to Savannah GA on the Silver Meteor this month. I was curious how to deal with our baggage. According to our departing station there isn’t any checked baggage service. What do we do with our baggage when we get to station? Do they have to fit in our Roomette? Sure! Amtrak has two daily trains between New York City and Miami. Just call 1-800-USA-RAIL or check their website for details. Sherry, i am so delighted to read your vivid account, i really enjoyed it. In fact my husband and i are planning a trip to Miami for a graduation this year and i hope we can go also use the Silver Star? Glad to hear you’ll try our trains! If you are reserved on the Silver Star (there are two trains between NYC and Orlando) and not the Silver Meteor, be aware that more than likely, there will not be a dining car on your train. This means there is only the café car and it gets crowded. I’m going to assume that you have reserved a roomette or a deluxe bedroom for your journey. If you are on the Silver Star, your car attendant can go to the café car for you and bring your order to your accommodation. Sure is better than waiting in line for 30n minutes on a bumpy train! Have a wonderful time and remember…Amtrak isn’t like the TGV or Virgin trains. It’s all we have and despite the aging equipment and rough rides from time to time, it’s a wonderful experience. Thanks we look like doing Orlando to NY and return in May this year. We are from Australia, the train looks great. Sherry: I made the reservation on The Silver Meteor before I read some of the comments that were not satisfactory, especially that the trains are usually late. Before I cancel those reservations, please help this 82Yr old that was so excited before, and now I’m anxious and worried about the Claustraphobic situation. Thanks for any help. Thanks for sharing this experience. I’m moving to Sarasota next month, and have been thinking about taking this trip to NYC, I guess from Tampa. I need to figure out the best starting point. It seems there’s a shuttle from Bradenton, but I may want to drive to the station and leave the car there. It looks like an excellent trip for taking photos. Also my question would be are those food prices accurate still or have they changed drastically in the last 3 years. I can only hope having an amtrack membership helps bring some prices down or at least get you “on the right track” for saving later. Thank you for pointing out the errors. Corrections have been made. Thank you for pointing out the errors and the corrections are complete. A couple of corrections. Winter Park may have a commuter rail station, but it’s not Tri-Rail. Tri-Rail runs from Miami to Mangonia Park, just north of West Palm Beach. Also….Quantico is a MARINE base, not Air Force! Thanks for reading the article and hope you’ll have a better time with your Amtrak photos. Yes, I recently visited the Winter Park station. It looks great! Thank you so much for the tip on avoiding glare on trains. Nearly all of my photos taken through train windows have been marred by glare. Since you posted this, Winter Park has gotten a nice new station. Thank you for reading the article. No…there isn’t any issue with odors eminating from the toilet in the roomette. They are kept very clean for each new passenger in the compartment. Have a wonderful cruise (on one of my most favorite ships) and a terrific train ride to get to NYC. If you haven’t seen the new Winter Park train station, you’re in for a treat! Hint: To get through the immigration line more quickly after your QM2 cruise, hire a porter. They will whisk you and your luggage right through in no time at all. So glad to know you had an excellent Amtrak trip. Thanks for reading my post. Thanks for reading the post. Amtrak offers a USA Rail Pass which you can purchase for 15, 30 or 45 days of travel. Similar to a Eurail Pass, you also need to have a seat ticket. Sleeping accommodations can be purchased in conjunction with the Rail Pass. You can call 1-800-USA-RAIL and when “Julie” answers, say, “Agent.” Eventually, you’ll get a real person. Good luck and have a wonderful trip! Thanks for your comment. There’s something addictive about train travel. Have a good trip next year! It was early october, 2010, I traveled on the Silver Meteor from, Miami to Palatka, Fl., to visit with friends there – well, Melrose, Fl., actually, but Palatka was the closest station to Melrose. I rode coach, bought a snack lunch to take back to my seat. Coach seating is comfortable and accomodating being of a similar size to an airliners Bussiness Class seats. As the train neared Palatka I felt dissapointed that my journey of some eight hours was over, I could have happily continued on the rest of the way to Penn Station, NY. Next year sometime, I fully intend to do just that – ride the Silver Meteor from NYC to Miami and return again a couple of days latter. Thats my hope, anyway. Thank you for the informative post about Amtrak travel! My girlfriend and I are Australian and are thinking of traveling from New York to Miami as we have a cruise departing from there early next year (Jan/Feb). I was just curious is it possible to purchase tickets for this journey which let you disembark at a station if you want to stay somewhere for a night then catch the next service which passes through? For example if we would like to get off in Savannah, stay a couple of days then get on another service to Miami? Any advice would be appreciated. Hi Sherry, I loved your impression of your travel on Amtrak. I love Amtrak as well. My husband Carlos and I had a wonderful experience during July 2014. Loved the whole journey. I’ll try to answer your questions. Going coach isn’t the best option, but it certainly is the most economical. Bring small blankets and pillows for all of you, so you can be more comfortable. I’d suggest bringing snacks and beverages (water) with you, but remember that there is a good selection of food/snacks and drinks to purchase in the lounge car. For dinner in the dining car, I’d suggest that either you or your husband make your way to the dining car shortly after you board and speak with the dining car supervisor to find out how to best arrange your dinner seating if you decide to have dinner in the dining car. There are no reservations for breakfast or lunch. Penn Station is really very easy to navigate, especially if you enter from the street level at 32nd and 8th. Checked luggage is back in the corner on the main floor. Ask any police or Amtrak personnel and they will direct you. If anyone has a tablet or computer or video player, I’d suggest bringing several movies or ebooks (and earphones!) to pass the time. Thanks for writing and have a fun trip! Thank you for writing such a great article. My husband and two children are taking the train from NYC to WPB(August 9) and bought coach seats but now I am worried the kids (13 and 8) won’t be able to sleep at all in coach. Is it that noisy and uncomfortable? Also, thinking of bringing food on for dinner on Saturday night( We board at 3:15) when we leave and eating breakfast or lunch in dining car. Since there are no reservations how can we figure out how to go try and get a seat for all four of use without all of us traipsing through the entire train. We are LIRR people and have done Amtrak to Hudson NY but never an over nighter. Penn station is always so chaotic – will it be evident when we get to our train how to check our luggage etc? Thank you for any answers and for your articles. Excellent article. A friend of mine traveled Amtrak from Washington DC back to Fort Lauderdale after my wedding in D.C. and had the same sleeping car. We have been thinking about an overnight train trip with a sleeping car and after this article, I will definitely do it! Yes, you can travel from WPB to New York. If you visit http://www.amtrak.com or call 1-800-USA-RAIL, you’ll get answers to all of your questions. 1. Can be a possibbile to travel from W.P.Beach(or Palm Beach Garden) to New York ? 2.If yes how much it costs ? 3.How much time will travel keeps? 4.Do there have a bedroom (cabin)for a familly couple? Thank you for reading about my train experience. My best advice, especially if you are planning to travel during Thanksgiving, is to book your deluxe accommodation as soon as possible. Not only do the rates increase as the amount of sleepers decrease, there are only a handful of the deluxe sleepers. Have a wonderful rail journey. Thank you so much for having all this information for us who dont fly. I have a fobia of planes, my partner, Maria doesnt, as a matter of fact shes scared of the train derrailing bc weve seen in the news such a horror happening, but shes willing to take a relaxant so she can do it. We are planning to visit out cousin in Queens , N Y for Thanksgiving. We want the accomodations ” Deluxe”, comfortable and a little more spacious, with the bathroom inside, etc. We are waiting for our son Robert to let us know if his coming with us or not, i told him to let us know A S A P, bc especially in Thanksgiving Amtrak gets booked. Please give us some feed back, we would love to hear from you. Elisa and Maria. I apologize if I did not reply to your email last week. If I understand your question, yes…all of the coach seats recline. If possible, I would suggest that you contact Amtrak and see if any roomettes are available for purchase. There is also a senior discount on the rail fare (not accommodations) for 62+. Bon Voyage! Thank you Sherry! Those are excellent tips! Sorry for the confusion. Sitting up in coach is do-able. Bring an small pillow and travel blanket for the most comfort. Someone once suggested the purchase of two seats next to each other, and have one seat remain empty. I don’t know if this is permitted but it’s definitely a way to a better night’s sleep. Also, I’d suggest DVDs or books or some distraction. You can still of course, enjoy the dining car and lounge car. Alternatively, check out the price of a sleeper at various segments along the way. For example, at Richmond, Raleigh or Rocky Mount to Tampa. You’d be in coach til Raleigh and then move into the sleeper in the evening. Sometimes you can save money this way. Regarding your previous response (see below), I was referring the the physical experience of riding in coach for 24 hours. Thank you! Hi Sherry, I’m wondering if you have any idea or thoughts on what it might be like to travel the same distance in coach. From Philadelphia to Tampa is $530.00 with a room. Thank you! Rates on Amtrak fluctuate as unpredictably as the airlines. You can continue to check pricing and availability at Amtrak.com in case there is a price drop. I’m wondering if you have any idea or thoughts on what it might be like to travel the same distance in coach. From Philadelphia to Tampa is $530.00 with a room. Thank you so much for your reply Sherry. We definitely plan to arrive the day before. And I will look into the Winter Park station. Sorry to hear that your Autotrain was so late. The Silver Service between Miami and NYC usually runs pretty close to on-time but if there is a freight delay, it’s the fault of the freight lines as they have right of way over passenger trains, as there’s nothing to do but wait. I would definitely suggest arriving the day before, just to be safe and to start your cruise relaxed. Since you are leaving from Port Canaveral, I will guess that you plan to get off/on the train in Orlando? There usually is a Hertz rental right there at that station. 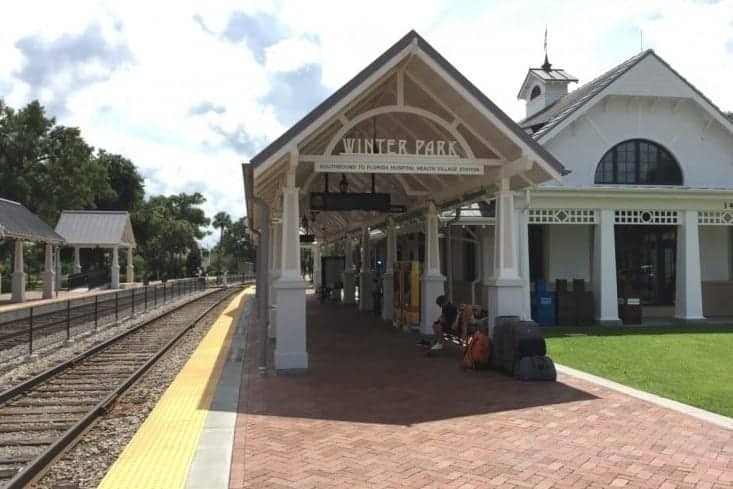 Another convenient Amtrak station is Winter Park…the station just north of the Orlando station. There is an Avis rental 1/2 mile away and they will pick you up at the Amtrak station to get your car rental at their office. That’s the station that I always use; less crowded, quaint neighborhood and they’re building a new facility. Have a great train ride and a wonderful cruise! Thanks again for stopping by! I just happened to run up on your page while searching for information on the Amtrak travel between NJ and Orlando. Can you tell me how on-time the train is? Is it often late? I’ve traveled by rail several times. Our last family trip on Amtrak was on the Autotrain and it was about 7 hours late. I know the Autotrain is much longer, so perhaps that kind of delay is not typical. We are planning to cruise out of Port Canaveral, and a train ride would be much easier on the wallet and the nerves than flying. Any input you have would be helpful. Love your website! Thanks very much for watching my video. Yes, a taxi to the rental car facility or check to see if one of the rental car companies can pick you up at the Miami Amtrak Station. Actually, I think there may be a Hertz counter right there. Regarding the upper level, the Silver Service trains between Miami and NYC are one-level. You can try to choose a compartment in the middle of the car. If you’re not sure, ask the Amtrak reservationist. Generally, the mid-car roomettes are not the lowest numbers. And about the wine glasses, in the dining car, the wine glasses are glass. Not sure about from the club car, though. add to the discussion. It is caused by the fire communicated in the article I read. And on this post Riding the rails overnight on Amtrak from Florida to New York City. responses come across like they are written by brain dead folks? you list the complete urls of your shared sites like your linkedin profile, Facebook page or twitter feed? There are two Amtrak trains between New York City and Miami. You can choose either one as they are both the same type of train. The only difference is the departure times. If you want to spend more time in Miami, then I would suggest that you reserve a roomette on the later train. I hope this is helpful. Thank you. Thank u Sherry for ur reply. Now we are more determined to take the Silver Star Amtrak from Miami to NYC in June 2014. We hope there will be many others to join and we all can become new friends. Just one more query, how many hours exactly the trip will take, as there are different figures from two sources, 21,5 and 28 hours. Our best regards from Bali Indonesia. Thank you for relating your train experiences. Sadly, public restrooms in coach cars, whether here or in Europe, are not in the most perfect condition after several hours of the trip. The only exception I would remark, is on the long-haul, cross-country Amtrak trains. The roomettes do not have their own facilities and except for one restroom on the upper level, there are several on the first level. Thankfully, the Amtrak car attendant keeps the restrooms in great condition and sanitation, throughout the two-night train trip. Have a wonderful train trip from NYC to Jacksonville. The sooner that you reserve a roomette, the lower the fare. Thank you for your question. I would suggest that you contact Amtrak (+1.800.USA.RAIL / +1.800.872.7245) for exact requirements. I would suggest that you use checked baggage for your four pieces of over-sized luggage and pack one or two small carry-on bags for the overnight trip. Luggage must be checked in at the station no less than 30 minutes before departure. Have a wonderful train journey. I am Indonesian with global citizenship, have homes in Bali, Jakarta Java, Singapore, Kaysville Utah and L.A. Ca. My wife and I both are over 60 and love to travel all over the world. In USA we have travelled on Route 66 from Chicago to LA, cruises to Alaska and the Bahamas, as well as taking Amtrak LA to San Diego, SF to Salt Lake City, NYC to Boston and DC. We are now dreaming to take Amtrak Silver Miami to NYC on summer June 2014. We wonder if we can share with tourists from oversea who have had the experience with Amtrak Miami to NYC route. Among other questions is on bringing big size luggages since we will travel around the world, at least each of us will carry two big size 32″ suitcases. Will it be convenient to travel on Amtrak train with four such suitcases plus hand carried bags? Thanks, Peter. Enjoy your next train ride. I love trains and I loved reading your report. Beautifully written with warmth and humor. I am Australian and try and travel on trains at least once every trip. I am looking at travelling Orlando to New York in December. Last month I did the Adirondak train from New York to Montreal. I really enjoyed the trip. Then did Via from Montreal to Toronto. I have also done the short NYC to DC run. Thanks for your nice comment. In regards to tipping, it’s customary to tip your room attendant $10-$20 per room, depending upon the level of service, for example…if you ordered dinner in your compartment it’s your room attendant’s job to take the order, pick it up and deliver it to you. In that case, I’d definitely go with $20. Since your meals are including with First Class, I recommend: $2.00 pp at breakfast, $3-4.00 per person at lunch and $5.00 pp at dinner. These are just guidelines and reflect an 18-20% tip should you have had to pay for the same meals. For your room attendant, it’s customary to hand him or her your tip as you depart the train at your destination. Hope this is helpful. Enjoy the journey and cheers! Thanks for reading the article. You’ll have a fine time on the train to NYC. Travel light and for convenience, pack a separate overnight bag (or keep what you’ll need for the train trip separate) and it’ll be a breeze. Save room at dinner because the desserts are great! Thank you for reading my stories. I totally agree. Definitely a roomette up the east coast and a bedroom going west…anywhere west! Save travels and thanks again! Sherry, I enjoyed your train accounts both to LA and NYC. We take the train all the time and with the two of us we are partial to the roomette each. For FL to NYC and the bedroom going to LA. I always tell people it is like singing “America the Beautiful” traveling westward on the train. You get to see the beautiful country in which we live. I love coming in to D.C. and watching all the symbols of or country from the train. I am fascinated by the Winter Park station in FL.To me it looks like a quaint little town. People are always amazed that one can go from the East Coast to HI without flying. Continue to enjoy your travels. No special deal. It was a one-way ticket so it was just about half of what you were quoted for a round-trip. Have a wonderful time. Hello, It looks like you had a wonderful trip. I am planning my trip to NYC from Jacksonville, fl with my two children. It will b a first for them. However the price are just for me and my son round trip approximately $800-starting in Charlotte nc- I can’t include my daughter online -have to do it over the phone-. How did you get this low fare considering it was starting in Fl? Did you have a special deal? Thanks for your kind comments. I totally agree about train travel! Lovely photos and interesting travelogue! My wife and I took the Zephyr year before last and plan a trip on the Empire Builder this summer. Also rode the Silver Star a few years back. Train travel is the best! Thanks, Bernie. Appreciate your comment. Great tip about taking the photos while travelling backwards to minimise the glare. And a lovely travelogue too – train journeys are definitely high on my favourites list.